Tell us about your dream Norway Tour. We will tie you up with 3 top Norway travel specialists who’ll compete to plan your custom trip in the best way possible. From majestic mountains and world-famous fjords to modern yet picture-perfect cities, Norway is essentially one of the most beautiful countries in the world. Picturesque landscapes here beg to be explored! Whether the summer sun glistening on a massive glacier or taking in the awe-inspiring wonder of the northern lights, Norway is an amazing adventure, no matter what the season is. A nation with a rich and storied past, Norway is a once-in-a-lifetime destination! Taking you Through the Best Norway Tourist Attractions! A Scandinavian country famous for it is a natural beauty with remarkable fjords and snow-capped mountains abounding, Norway has made its way into the bucket list of each enthusiastic traveler around the world. From beautiful mountains, glorious fjords and plenty of churches and lighthouses, there are plenty of places to visit in Norway for that perfect trip with friends, family, and couples. Above everything else, it is the dream of many to catch a glimpse of the breathtaking Northern Lights once in their lifetime. Landscapes offer access to the northern lights and the midnight summer sun as the wilderness outside of the main cities and roadways is on a grand scale with little tamed. The deep blue of the fjords and bright white of the snowy peaks reflect the natural majesty and locals and visitors alike enjoy traveling between the jagged hills that are covered in forest and learning of the marauding Vikings and their storied history. The thin band of the country stretches from the choppy channel that separates the southern coast from Denmark and reaches the western shores of the Atlantic towards the Arctic Sea. 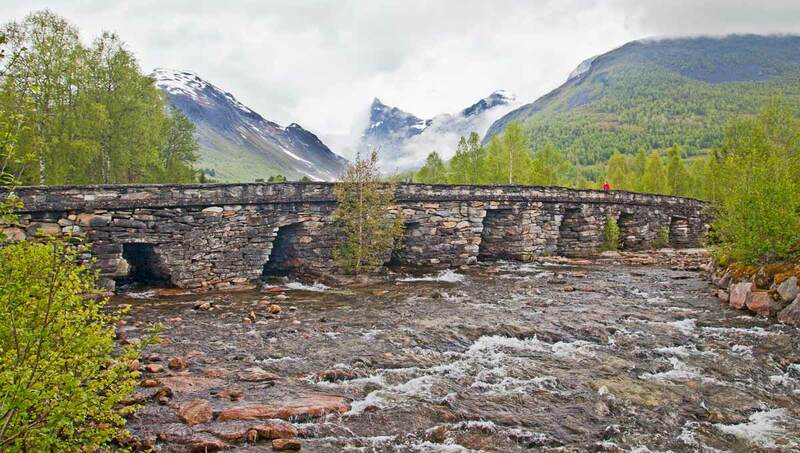 The Swedish border Norway to the east beneath the northeastern borders of Finland and Russia as rippling glaciers and sunken river valleys fill the inland amidst the soaring mountains and harsh weather of the highlands. Apart from a history of Vikings, the fjords remain the most notable tourist draw in Norway with the infrastructure focused on traveling the emblematic waterways. The kingdom of Norway has existed continuously since the merging of the collective petty kingdoms in the 9th century. The long history of the country dates back to the 11th and 10th centuries BC with the Ahrensburg culture during the Upper Paleolithic period. The early occupants found shelter in the landscape once covered and carved by the huge ice shelf from the last ice age. During the Bronze Age between 3000 and 2500 BC, new Indo-European settlers arrived in eastern Norway to tend sheep and keep cows. Farming slowly became the main source of livelihood with hunting and fishing acting as secondary means. Archeologists have uncovered the majority of settlements and artifacts in Norway during the Iron Age that date back to the 3rd century AD with time periods split between pre- and post-Roman contact. By the fall of the Roman Empire in the 5th century, a more vibrant history of Germanic people emerged with rich graves for tribal chiefs filled with magnificent weapons and hill forts built for defensive purposes that led to the Viking age of the 8th and 10th centuries. The wider Scandinavian region gave rise to the Viking clans characterized by an age of expansion that spread to Iceland, the Faroe Islands, and Newfoundland, in Canada. A Golden Age swept across the country during the 14th century as trade increased and peace helped establish Norway as a collective, sovereign nation before the plague arrived. When German and English tourists arrived in the 19th century to explore the fabled fjords, the exotic and rich landscape contrasted with the impoverished locals. Norway has since become one of the most civilized countries in the world with an educated population that practices tolerance, loyalty, and pride for their nation. After the discovery of the vast oil and gas reserves under the Norwegian Sea in the 1960s, cities like Oslo and Bergen grew the largest populations in Norway. With attractive architecture and clean streets that shine with their relaxed and friendly ambiance, the cities feel more like a friendly village more than an urban culture. As of 2017, Norway has a population of over 5.2 million people and the colloquial, welcoming ambiance remains. Fish has always been a great source of food due to Norway’s more than 15,600 miles of coastline. The dishes often consist of pickled herring or cured salmon, fresh catfish, halibut, and monkfish. However, elk and reindeer remain a part of the contemporary diet for a popular source of protein. Cold cuts are also a popular addition to breakfast, lunch, and dinner while picnic foods like bread, cheese, yogurt, and local fruit like lingonberries, raspberries, and apples are also delicious and easy to find treats across the country. One of the newer, more surprising culinary delights of Norway is the country’s profound connection to coffee, with the average Norwegian drinking nearly 16 pounds of coffee a year. Norwegians support the newer cafes that gained popularity in the late 1990s, and cozy places to enjoy a cup of a coffee abound. Whether trying the local flavors of the coffee, cruising down an immaculate fjord, or trekking up the side of a glacier, you can enjoy the company of locals, bask in endless summer sunlight, and embrace the rich Viking history found near the Arctic Circle. Oslo is a city of innovation that is surrounded by the lush forested hills and the glistening waters of the Oslofjord. The vibrant capital of Norway has a relaxed and amenable attitude with a focus on reinvention and constant growth. The city was established in the mid-11th century and became the capital of the settlement under Haakon V of Norway near the 13th century. A massive fire that lasted three days destroyed Oslo in the 17th century, and instead of rebuilding the old city, Christian IV of Denmark constructed a new city near the base of Akershus Castle while an unmanaged city grew around Oslo’s Old Town. The economy later boomed with the shipbuilding trade in the 18th century and gained a reputation for state institutions in the 19th century with the construction of the Bank of Norway, the Royal Palace, and the Storting, the supreme legislature. The population increased dramatically by the 20th century, and growth continues into modern days. Daylight varies considerably between summer and winter, with the height of summer bringing more than 18 hours of sunlight and winter offering nearly 18 hours of darkness. Temperatures reach an average high of 67 degrees Fahrenheit between May and September while the temperatures drop to an average low of 26 degrees Fahrenheit between November and February. Oslo is one of the world’s largest capital cities in terms of its overall area, which reaches 50 square miles. However, only 20 percent of the city is developed with the remaining landscape consisting of parks, protected forests, and gorgeous lakes that integral to the cityscape. Pathways, trails, and walkways make each neighborhood pedestrian friendly, including the main street of Karl Johans gate, which connects Oslo Central Station to the Royal Palace. The city embodies the heritage of Norway and the abundant connection to culture with commercial galleries displaying the thriving contemporary-art scene and neighborhoods once brought to life in the stories of Karl Ove Knasugård and Jo Nesbø. The metropolis of Oslo has one of the lowest carbon footprints of any city in the world with a commitment to sustainable food production. The many areas of elegant green space with waterways and islands are just minutes away from the city center, and the hills around Oslo provide perfect destinations for skiers in the winter with trails that lead through the Nordmarka forests. The city has also become a culinary destination for coffee drinkers and the Neo-Nordic food movement. The diverse architecture shows the city’s commitment to redevelopment while also preserving its historical aesthetic seen around Akershus Fortress. The dramatic medieval castle has stood on the promontory overlooking Oslofjord since the turn of the 14th century and continues to dominate the harbor. The complex allows visitors to stroll through quaint chapel that hosts the tomb of Håkon VII, as well as visit the Museum of the Norwegian Resistance, which contains remarkable displays regarding the German occupation of Norway from 1940 to 1945. Nearby, the Vikingskipshuset has restored two Viking longships once used as centerpieces for grand ceremonial burials 1,100 years ago. After discovering the ships in the 19th century, the pieces have since provided an emotive insight into Viking traditions and the unique world of their time in history. The largest ship is known as the Oseberg, and it had a burial chamber that held an incredible number of artifacts all on exhibition. The Oslo Opera House acts as the centerpiece of the city on the developing waterfront, and the iconic modern architecture illustrates the progression of the city with a design that resembles a floating iceberg along Oslofjord. The structure is not just for tourists and instead showcases both first-class opera and ballet performances. The style of the exterior does aim to celebrate Norway’s unique ability to balance public life, conservation, sustainability, and personal experience. The city of Bergen has an air of majesty and mystery that rises from the mist that shrouds the surrounding forests along with the annual average of 260 days of rain a year. Despite the damp weather, or perhaps because of it, Bergen boasts one of the most enjoyable atmospheres in all of Norway. Seven hills roll across the northern edges of the city while islands populate the waters along the south and west. Old stone buildings reflect the historical architecture amidst terraces that are decorated with tiny wooden houses and excellent museums. 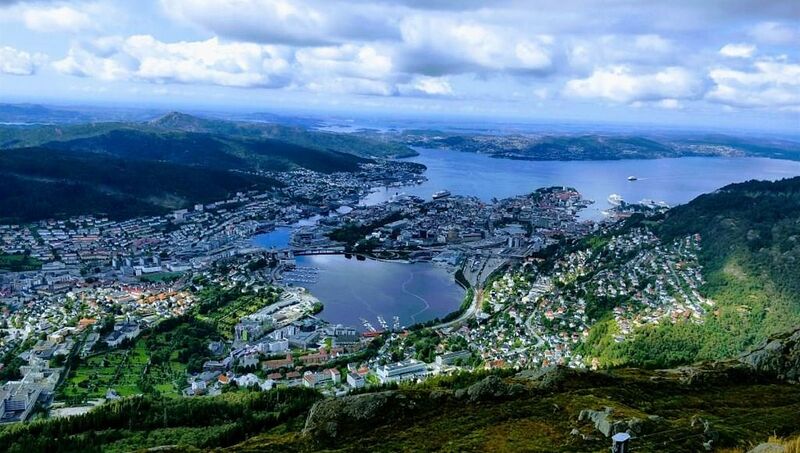 The flavor of the city appeals to both residents and travelers of Norway thanks to Bergen’s history as a major port. The industrial center has a relaxed ambiance with fresh nautical air with delectable fish coming from the open water and nearby fjords. Impressive restaurants and compelling art galleries add to the sense of a decadent culture bolstered by the dynamic nightlife. King Olave Kyrre founded Bergen in the 11th century, which quickly grew in importance to become the largest medieval city in Norway. Bergen was known as the ecclesiastical center of the kingdom with approximately 30 churches and monasteries before opening a port that connected the kingdom to other European cities through trade. German control reigned and then faded between the 14th and 16th centuries over the harbor, but local fishers remained impoverished well into the 20th century before the city shifted from its dependence on the fish trade to a lively contemporary city. While the city sits at a northern latitude, the coastal position helps keep the temperatures milder than its geographical position would suggest. Summers reach an average of high of 64 degrees Fahrenheit between May and September, but winter temperatures can drop to an average temperature of six degrees Fahrenheit between November and February. - Stroll through the colorful and historical Bryggen Hanseatic Wharf, as the seaside neighborhood has welcoming restaurants, fascinating workshops, charming boutiques, and unique narrow alleys that hide old wooden merchant houses. - The Edvard Grieg Museum was established in the stunning Swiss-style wooden villa and is decorated with fragrant gardens that tumble down the hillsides to overlook the peninsula and Nordåsvatnet Lake. The historical home contrasts with the modern exhibition center that features a 200-seat concert hall. - Bergenhus Fortress continues to dominate the harbor’s entrance and has stood protecting the entrance to the city since the late 16th century. The impressive Scandinavians structure now hosts a museum with exhibits on the contribution of women during the resistance to German occupational forces in the 1940s while also offering access to walls of a 17th-century castle built on the remains of a stronghold erected in the 1100s. - Grieg Hall embodies the drama of a modern architecture aesthetic contrasting with the antique wooden homes of the harbor. The impressive public building hosts opera, ballet, and classical first-class classical concerts in the theater known for incredible acoustics. The world-famous fjord is listed as a UNESCO natural heritage site. In terms of Norway’s Fjord Network, Geirangerfjord is one of the region’s smallest, but it is also one of the country’s most breathtaking. The branch of the Storfjord digs inland from the coast, snaking between dramatic mountains. The towns of Helleysylt and Geiranger have settled on opposite sides of the water, west, and east respectively. The meandering branch reaches more than nine miles long and boasts a collection of sensational waterfalls, including the Seven Sisters Falls. The cascade of Seven Sisters is the 39th tallest waterfall in Norway at 1,350 feet above the water with the longest singular drop reaching 820 feet. Legends claim that the Seven Sisters dance flirtatiously down the mountain while the single cascade stream on the opposite ridge, known as the Suitor, proposes without success. The remarkable scenery inspired the landscape in the famous 2013 Disney animated feature “Frozen.” The receding glaciers from the last ice age carved out the deep waterway and high mountains of the fjord, filling the landscape with rich soil that feeds the lush forests to blend the endless greenery along the hills with the sharp blue-green water. The different ways of viewing Geirangerfjord offer distinctive experiences. The northern road brings narrow switchbacks that come to reveal the village in front of the glinting waters. The road from the south passes between the mountains and zigzags into Geiranger with two fascinating vantage points. Dalsnibba summit reaches nearly 5,000 feet above sea level for spectacular views over the surrounding cliffs and waters below, and visitors can also venture inside the water on a cruise ship or simply relax on the ferry, which doubles a sightseeing trip between Hellesylt and Geiranger. The fascinating city of Tromø is located nearly 250 miles north of the Arctic Circle and has the ninth largest population in Norway. The northern scenery of the region highlights the unfettered countryside with lush meadows and snow-capped mountaintops. Beyond the untamed and the unmatched beauty of the landscape around Tromsø, the Arctic north remains the largest attraction as the intricate mainland fractures into twisting fjords and remote islands. The city has become the social and cultural capital of the northern territory as a settlement that dates back to the Middle Ages. Seafarers would take shelter in the harbor and pray for safety at the church with foundations dating back to the 13th century. The town received an official charter by the late 18th century when locals worked in the fishing industry and used the port as a trading station. By the 19th century, trappers ventured inland to hunt arctic fox, polar bears, reindeers, and walrus before explorers traveled north and into the depths of the Arctic. Although the city is less than 1,500 miles south of the North Pole, the Gulf Stream regulates the climate and keeps the harbor, as well as the greater Norwegian coast, free of ice. Temperatures in summer average highs of 56 degrees Fahrenheit between May and September and drop to average lows of 23 Fahrenheit from December to March. The friendly ambiance contrasts with the remote position thanks to the enchanting mountains, fjords, and a rich collection of restaurants and bars. The city center has a compact design on the eastern shores that overlook the bridge and coastline of its home, the hilly island of Tromsøya. The university keeps the youthful atmosphere pulsing through the city throughout the year and the school’s museum contains relics of the region’s indigenous people as well as fascinating information on the picturesque northern lights. - The Northern Lights have become one of the city’s main draws for tourists from around the world. The lights are most visible between late September and late March when the sun continues to set in the early afternoon and does not rise until late morning. While slightly visible from town, the best way to find the Aurora Borealis is by camping in the Lyngsalpene Mountain Range. - The Arctic Cathedral was constructed in the mid-20th century with architecture reminiscent of glacial crevasses and the balletic light of the aurora borealis. Stained glass windows occupy the east end of the cathedral and depict Jesus’ descent to earth as the west end of the gallery has an organ with pipes that resemble icicles. - The Science Center of Northern Norway contains the country’s largest planetarium. The digital screen projects an exciting close up of the flickering lights of the aurora borealis along with a chance to explore regional phenomena through 80 interactive installations on arctic related themes. - Fjellheisen is a cable car that leads to the top of Mount Storsteinen at nearly 1,400 feet above sea level. A network of trails branches off from the station, and the trip takes just four minutes and provides exceptional views over the islands, mountains, waters, and city. In the summer, passengers can travel to the mountain for views of the midnight sun while in the winter, the cable car closes at 10 pm. A popular restaurant is located at the upper-station offering delicious meals with unforgettable views of the fjords. The town and municipality in Oppland county became internationally renowned after the 1994 Winter Olympics. The city center retains a touch of the late 19th century with a concentration of wooden homes that bring panoramic views to the northern edges of lake Mjøsa and the mouth of Lågen River. The mountains enclose the town with rolling, lush forests and contrast with the glassy waters of the lake. The annual climate reaches average highs of 64 degrees Fahrenheit between May and September but plunges to an average of 25 degrees Fahrenheit from November to March. Artifacts from the Iron Age highlight the long-standing settlements within the region, as well as a mention as a site for council in 1390. By the 19th century, a lively marketplace brought Lillehammer into the forefront of Norway as a merchant city. The town remains a popular center for winter sports enthusiasts hosting cross-country and alpine skiing, as well as opportunities to visit museums and cultural centers with a backdrop of vibrant shopping. Restaurants carry on culinary traditions using ingredients cultivated on a historical farm that dates back to the middle ages, and the Olympic bobsledding track continues to attract thrill-seekers to experience the legendary rush. The Per Gynt Festival is another highlight and one of the country’s leading cultural celebrations to bring together drama, music, and nature to commemorate the Norwegian spirit. - The Maihaugen Open Air Museum is a folk park with 180 buildings collected from around Norway. Many of the structures have been rebuilt to resemble a traditional inland village as the turf-topped houses and shops reflect the heritage of settlements in Norway and draw attention to the stave church taken from Garmo. - Olympic Park commemorates the 1994 Winter Olympic but also serves as a sustainable repurposing project as an example for other host cities. The amenities remain in use and visitors can wander through the Norwegian Olympic Museum with exhibits focusing on the 1952 Oslo games and the 1994 Lillehammer games presented through interactive installations. Authentic artifacts from the game's number in the thousands to share the stories and highlights through modernized multimedia presentations that were redesigned in 2016. - Lillehammer Art Museum is a fascinating architectural structure of metal and glass and resembling a spaceship at the heart of the city. Exhibits reflect the evolution of visual arts in Norway from the early 19th century to the present and include a display of minor works by Edvard Munch. The galleries host over 100 paintings from adherents of Matisse school and nearly 160 paintings crafted between the 1980s and 1990s. It is often thought that the accommodations in Norway are very expensive when in fact, Norwegian accommodations average the same nightly price as hotels in London, Paris or Rome. Norway provides an abundance of accommodation options for tourists, from lavish boutique hotels to sophisticated, eco-friendly lodges away from the familiar beaten paths. Sleeping arrangements can be anything from a charming room in a bed and breakfast to a quiet stay in a cabin or a guesthouse, or the glamour of a designer hotel and its amenities. As a popular travel destination, especially for tourists interested in visiting the famous fjords of Norway, the country has developed an array of hotel brands known for distinctive characteristics amidst the concrete and glass high-rise structures across the main cities. The hotels in Norway hold themselves to a higher standard of service and do offer weekend deals and beautiful breakfasts. While the luxuries tend to be great, the size of the rooms in larger cities, like Oslo, may fall on the small side. The more notable hotel brands offer all manner of accommodation ranging from historical family-owned properties in rural Norway to elegant, contemporary rooms at the heart of Bergen. Budget options include hostels, campsites, and mountain huts hidden amidst the famous landscape. In recent years, visitors to Norway have also spent more time in single cities using local apartments as a base to explore the greater surrounding areas. Part of the joy of Norwegian accommodations is finding charm and comfort in a unique property outside of Oslo or in view of the serene waters of a fjord. Timber cabins dot the countryside and provide peaceful getaways with a variety of design. While the exterior may feel like a formal, cozy log cabin, the interior could contain a similar classic appeal or have a modern contemporary design. Mountain huts have strategic locations across the country and connect with the major hiking routes that crisscross the valleys, plains, and mountains. Staffed, self-service and unstaffed huts provide different experiences from catered meals and private rooms to a dorm-like environment. Farm stays have also become a popular way to explore and experience Norway’s countryside, as well as the local cuisine that has risen thanks to land cultivation, fishing, and hunting. One unique hotel opportunity allows guests a view over Geirangerfjord with floor-to-ceiling windows resting on the cliff’s edge. The best hotels in the country to escape the old stigma of high-cost with extravagance and strive to create an unforgettable experience within the incredible culture and scenery of Norway. Whether you are glamping in the south, luxuriating in a ski resort, or breaking from the norm to relax beneath the dancing aurora borealis in the north, Norway offers exactly what you are looking for. Exploring Norway is the trip of a lifetime for travelers looking to visit the famous fjords or wander through the vast plains in search of the northern lights. The reflective turquoise waters, dramatic cliffs, spectacular waterfalls, and the captivating history of Vikings combine to create an exceptional destination that will surpass your wildest expectations. The stirring landscape along with the natural fortresses and verdant forests give way to blankets of snow and crystal glaciers. The ambiance around the cities, towns, and the expansive wilderness itself brings opportunities for romantic exploration, family fun, and luxurious insight into the natural splendors of Norway, a country known for immersing visitors in its dreamlike scenery. Getting to Norway has become easier since the expansion of Norwegian Air and the growing popularity of Oslo as an international destination. The capital city of Norway receives the largest number of international flights, however, Bergen and Tromsø, as well as smaller airports around Norway also receive flights direct from various cities in Europe. The main airlines servicing Norway include Norwegian Air, SAS, a Widerøe, the latter being a predominantly local carrier that travels between smaller towns and cities, including the Lofoten Islands. Members of the European Union and the United Kingdom do not require a visa to enter Norway but may be asked by border agents how long they expect to say in the country. Visitors from the United States, Australia, and New Zealand have easy access to Norway for up to 90 days without the need for a visa. All travelers to Norway, except those from Denmark, Iceland, Sweden, and Finland, require their passports at the border. High season for travelers to Norway reaches its peak between mid-June to mid-August when the Midnight Sun allows visitors to enjoy a more active lifestyle due to the longer days. Be sure to book accommodations and transport in advance as rental cars, ferries, and trains sellout due to the influx of tourists traveling through the country. Shoulder season remains the best time to visit Norway, which takes place between May to mid-June and again from mid-August to September. Fewer people crowd the popular destinations and the weather remains clear and comfortable during the shoulder season, however, accommodations and transportation should still be booked ahead of time as many Norwegians travel around the country for festivals. The low season takes place between October and April when the cold weather slows tourism as shorter days make active exploration difficult, and some attractions close for the winter. However, the spectacle of lights known as the aurora borealis continues to attract people to the far north creating a miniature high season. Travelers from North America will need to bring power converters or adapters with them to Norway to account for the change to traditional European plug with two round prongs and 220 volts of electricity. An adapter helps your plug adapt to the system in place, turning your possibly three-pronged plug into a two-pronged end to fit into the socket, but this does not modify the voltage your device receives. A converter accepts the charge and changes the voltage to fit with the particular device you need to charge or plugin. Check the label near the power cord of your device. If the cord, charger, or device says 100-240V or 50-60 Hz, you can use an adapter. However, if the device does not clearly state this or you are concerned, use a converter to remain on the safe side. The majority of electronic devices like cell phones and laptops were constructed to withstand up to 220 volts. Important note: Do not bring a hair dryer to Norway, even with a power converter. Their power consumption rate is extremely high, and an item like a hair dryer needs to match the correct voltage with specific converters in mind for Norwegian sockets. Instead, check your accommodations ahead of time to see if they provide hair dryers as an amenity. This will also save you space in your luggage. The national currency of Norway is known as the Norwegian Kroner (Nkr). The country is closely allied with the European Union and was a founding member of the European Free Trade Association (EFTA) but is not considered a member state of the European Union. Norway voted no to the referendum about joining the European Union in 1994 and has retained a national majority of over 70 percent of citizens opposed to joining the union due to annual growth of GDP remaining significantly higher than the EU average. When visiting Norway, prices in stores and informal markets have a fixed-price, and bargaining or haggling is frowned upon. In Norway, ATMs are widely and readily available, but locally they are referred to as “Mini-Banks.” The majority of ATMs across Norway accept credit cards as well as bank cards, the most common of which are associated with Cirrus, Visa Electron or Plus Bank cards. The ATMs, as well as your bank, may charge service fees for using a machine not associated with your specific branch. Always let your bank or credit card company know you will be traveling abroad before you leave the country in order to keep your card unlocked if a security question arises. Taxis, ferries, shops, restaurants, and hotels generally accept credit cards, debit cards, as well as Norwegian kroner. Traveler’s checks are becoming less common around the world and therefore are becoming more difficult to cash when abroad. Some institutions like banks and post offices will continue to cash the traveler’s checks but these are limited and the rates marginally better than exchanging cash. Most savings become obsolete after the service offices charge commission. While travelers from North America are accustomed to tipping, Norwegians do not expect the same scale of gratuity from travelers nor resident Norwegians. When dining in a restaurant, the service charge and tips are included in the bills, as well as on a taxi fare. If you feel the service went above and beyond your expectations, particularly if at a top-end or midrange restaurant, servers appreciate a five-percent gratuity, while a 10 percent tip is very generous. If you prefer to pay for your meal with a credit card, space exists on the receipt for adding an extra tip. A common form of tipping in Norway occurs by the diner rounding up the amount of the bill to the nearest tenth. For example, if the bill is 94.50 kroner, and you appreciated the service, an appropriate tip would be to round the bill to 100 kroner. However, staff in hotels are very well paid, so tipping the porters or other hotel staff is uncommon. The price of the accommodation usually includes a gratuity for the service workers. This is also true for tour guides. If you do want to tip your guide after an incredible tour, they will always appreciate the gesture. The popular image of Norway is that of a cold and remote destination showered with an inhospitable climate. The image has some truth to it, but there is so much more to the weather patterns of Norway as they shift dramatically by season, topography, and the constant flow of the North Atlantic Current. The different seasons provide various reasons for traveling to Norway as the long and dark days of winter provide ample opportunity to ski, dog-sled, ice fish, snowmobile, and of course, search for the northern lights. The warmer days of spring continue to bring skiing adventures as well as the popular Sámi festivals. The expanding daylight melts the snow to bring an innumerable number of cascades to decorate the beguiling fjords while prairies and plateaus glow with wildflowers. Autumn carries the golden sunlight and smaller crowds while maintaining the same beauty for which Norway is known. But summer remains the most popular season to visit Norway thanks to its frequent public transport connections, the endless sunlight, and access to the ample beauty of Norwegian scenery. Summer temperatures can reach the low 80 degrees Fahrenheit but drop to negative 13 degrees Fahrenheit in winter. The temperatures of the inland areas differ greatly from those on the coastline, which feel the warming effects of the North Atlantic Current. July has the warmest trends with December to April hosting the most snowfall out of the year. Where and when you visit Norway informs your experience. If you prefer sun and greenery, late spring and summer are the best times to visit. If you want to experience the northern lights and perfect skiing conditions, late autumn and winter are your best chances. Norway averages a population of 13 people per square mile and is one of the least populated countries in the world. The majority of the entire population lives in the southern half of the country, which makes for a slightly different culture found between the southern and northern areas. The government is a constitutional monarchy, and the Royal Family has limited powers but remains well respected amongst its people. The relaxed ambiance of Oslo reflects the greater attitude of a country known for its tolerance of other cultures, nationalities, genders, sexual orientations, and religions. More than half the country are registered as members of the Church of Norway, the official Baptist religion of the country, but religion does not play an overt role in the daily lives or decisions of most Norwegians. The egalitarian culture holds fast to the tenants of Jante Law, which values humility, respect, simplicity, and equality. The ideas coalesced in the 1933 novel A Fugitive Crosses His Tracks, written by Askel Sandemose. People value honesty and respect first and foremost with less weight placed on the Western ideals of professional roles or marital status. Even though the majority of Norwegians maintain a relaxed attitude and welcoming air, certain areas of the country, such as smaller rural communities, have a more conservative view in terms of dress and loud or uncouth behavior. The government has instated strict environmental commitments pledging to reduce greenhouse gases by 40 percent before the year 2030 attributing to the already popular healthy Norwegian lifestyle. Life expectancy is second best in the world rated behind Japan due to the connection with green spaces, active lifestyles, and healthy work-life balance. Transparency is crucial in business, with customers, clients, or business partners taking their time in making large decisions. Communication is direct, removed from emotion, small talk, and obfuscation. Instead, talking about business provides each individual with equal footing by remaining honest about their expectations, ensuring an absence of pressure, and providing a well-regarded work-life balance. Employers frown upon, and even forbid, employees from not taking their paid leave. Norwegians speak volumes in their handshake. Unlike other Western European countries are known for the welcoming kiss, Norwegians greet one another with a firm and excited handshake leaving the kisses for their loved ones. Punctuality remains an important social grace when visiting a friend’s home or meeting someone for drinks. It is customary to bring a gift like flowers, a houseplant, chocolates, or wine to an engagement at someone’s home. If bringing flowers, do not bring an even number, as it is considered bad luck. Be sure to take off your shoes when entering the home, a tradition that is rooted in the days where most Norwegians worked in the fields or on the water and did not want to track their dirty shoes into the house. Politeness and mutual respect is an important concept and a tenant of everyday life in Norway as well is never using beer to make a toast. The food of Norway is a cornerstone of the heritage that drew heavily from the raw materials available in the different regions across the country. Mountains, prairies, and untamed forests, and vast waters provide Norwegians with plenty of fish and game. Many of the traditional dishes in the country reflect the poor standard of living that villages and larger communities faced before 1905 as the majority of Norwegians ate porridge up to five times a day. Standards of risen dramatically over the last century as in casual contemporary cuisine, Norwegians use seasonings like caraway seed, shredded horseradish root, thyme, and oregano readily. The game in Norway can vary widely depending on the region but is often grilled or roasted and served with traditional side dishes like minced fish with potato dough. The most common forms of the game in Norway are duck, goose, and reindeer, and never forget the popularity of the hot dog, an import from Denmark, but a favorite fast-food option often served on a simple flatbread. Unlike many other continental European countries, Norwegians enjoy their game more than the farm-raised meats like beef or pork. Seafood acts as the focus of the cuisine with residents from the coastlines to the mountains enjoying fish an average of three to four times a week. Many of the traditional dishes include fish that is poached, grilled, smoked, fried, or salted. The diet helps to play a role in Norway’s ranking as one of the healthiest populations in the world. Even breakfast revolves around the sea with dishes including smoked salmon, sardines in mustard sauce, and pickled herring, or smoked whitefish. Hard-boiled eggs and caviar accompany soft cheese, flatbreads, and fruit jam. Lunch consists of goat cheese and slices of salmon. Most adults take their lunch to work or school and enjoy open-faced sandwiches of sliced buttered whole-grain toast topped with meatballs or herring. Traditional desserts include a sour cream porridge and a layer cake stuffed with whipped cream and jam before being topped with almond macaroon rings. Norwegians traditionally drink up to 40 gallons of milk per year and enjoy Pils beer, a light lager with a low alcohol content usually less than two and a half percent. Some Norwegians substitute Pils for water due to its flavor, fizzy texture, and low alcohol content. Norwegians also use this beer as a chaser when drinking the national drink of akevitt, a schnapps-like alcohol made from potatoes and flavored with caraway seeds. The country has an affinity for meats, cheeses, bread, and fish, which is great for pescatarians and carnivores but difficult for visiting vegetarians and even harder for vegans. A handful of specialist restaurants are located in the larger cities like Oslo and Bergen, but many options include salads or vegetarians are urged to go to consider the fantastic markets that abound. Vegans face an even greater challenge as when not eating fish or meat, many dishes contain egg or dairy and the most popular side dishes include yogurt and cheese. It is, however, easy to learn what ingredients are used in each dish as the majority of people speak English and are happy to explain the contents of the food and assist as they can. The official language of Norway is Norwegian. The language has similarities to those of other Scandinavian countries like Sweden and Denmark, but Norwegian is distinct. Over 95 percent of the population speaks Norwegian as their first language, and a number of dialects permeate Norwegian with slight variations from the traditional language. Less than half a percent of the population speaks Finnish with the majority of Finnish speakers found in the northern region of Finnmark close to the border of Finland. However, nearly one percent of the population speaks Sami, a language related to Finnish and spoken by the Sami People historically known for settling around large parts of Norway, Sweden, and northern areas of Finland and Russia. English is the most common foreign language taught in school with the majority of the population fluent and even older generations maintain a limited, but well-established, proficiency. Any person trying for Norwegian citizenship must prove proficiency in Norwegian, Sami, or other Scandinavian languages or provide proof of attending a minimum of 300 hours of Norwegian language classes to help keep the language and heritage alive. Traveling through and around Norway has become much easier over the course of the last century. Norway has grown in its popularity for tourists and has committed to connecting its distant villages, towns, and cities that lead from the southern coast and along the North Sea to the tundra beyond the boundary of the Arctic Circle. Smaller flights cater to national towns, gorgeous train rides wind along the fascinating mountains, and ferries course through the magnificent fjords. The public transportation offers express ferries, passenger ferries, and a mesh of trains and buses provide reliable and comprehensive services. However, those services are often scaled back in the winter, especially in the north, but this does not leave any area of the country inaccessible for long. More than 50 airports service the whole of Norway, with at least eight offers some form of international connection. Oslo Airport is actually 30 miles north of the city center but offers connections to the capital by train, bus, taxi, or car rental. Domestic flights provide a great option when traveling to the North Cape or Svalbard. Regional companies like Wideroe and Danish Air Transport operate small fleets with national destinations while SAS provides Norway’s largest fleet, especially if flying to Norway from over the Atlantic. A ferry ride remains the most popular way to explore Norway as it remains the only option when visiting isolated islands and secluded coastal villages along the dramatic fjords. The Hurtigruten ferry runs the entire western coastline between Bergen and Kirkenes, covering a roundtrip journey of 2,500 miles and stopping at more than 30 ports of call. The entire trip takes 11 days and reaches a variety of ports positioned above the Arctic circle. However, the majority of ferries in Norway consist of car and passenger ferries in the western fjords around the Lofotens. Foot passengers can walk on and pay the conductor while car drivers pay when the conductor reaches their window on the jetty or when aboard the ferry. Only a small selection of the smaller regional ferries accepts reservations, while the remainder works on a first-come basis. Other forms of seafaring transportation around Norway include Hurtigbåt express boats. The catamarans are a great way to transfer between destinations when short on time but often provide a bumpy and cold ride due to the choppy seas. Rates vary considerably dependent upon the time of year, distance, and demand. The primary service operator for trains in Norway is NSB, which provides three domestic routes that link Olso and Stavanger in the southwest, Bergen to the west, and Trondheim or Bodø to the north. The routes and tracks are sights in and of themselves with several miles remarking on the feats of engineering ingenuity making the ride worthy of the trip alone. Local trains (Lokaltog) and regional trains (Regiontog) have standard classes, but a selection of regional trains also has Komfort, or luxury carriages, built with extra space and electrical plugs. The regional trains also have internet access, which passengers need in order to register their seat on the NSB website. Reservations are mandatory for long-distance intercity trains and any overnight or international service in Norway. Reservations are also recommended in high season, as seats can sell out quickly. Buses are a reliable and comfortable way to travel across Norway on short or long-distance journeys. Other than renting a car, buses are often the only way to reach the small or remote Norwegian towns far from the regional train stations. Nor-Way Bussekspress has the most extensive network of buses in the country and has teamed up with smaller carriers for an even farther reach to connect to trains and ferries, as well as reaching more remote destinations. Tickets are most often purchased from onboard the bus if not bought online ahead of time. 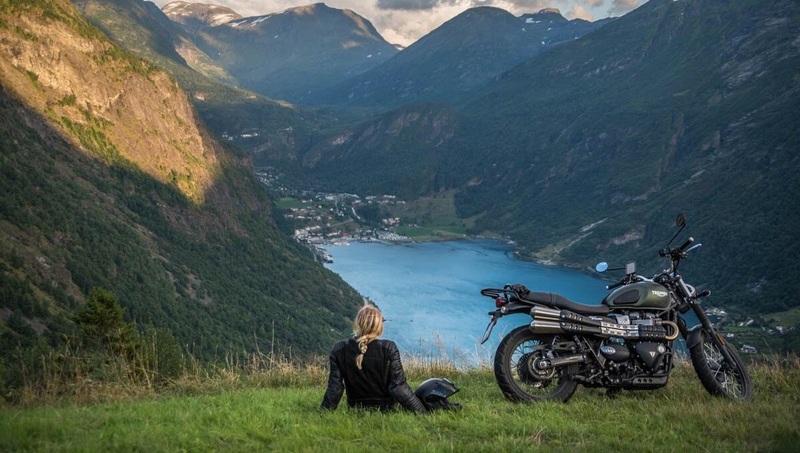 The best reason to travel by car is the freedom to explore at your preferred pace and enjoy a more intimate connection with the remote communities less visited by the buses, trains, or ferries around Norway. The infrastructure on the main roads is excellent with remarkable tunnels and stunning bridges as part of any journey. The narrow country roads wind around the crags and ridges of the landscape for a more harrowing, but equally exciting, experience in the summer. In the winter, many of these roads close due to the blizzards and ice, in addition to the government’s aim to concentrate on maintenance. Winter tires are compulsory on all cars, but in the winter, studs and chains are also recommended for safety reasons. Travelers and locals that are driving around the country roads of Norway from the southern coast to the secluded north are urged to pack provisions like proper hiking gear, extra water, and food rations, as well as to check the car thoroughly before departure to ensure a spare tire and extra petrol. - Toll roads on the main highways charge the car electronically. - The main roads host a plethora of speed cameras and the fines are very steep, so do follow and obey the speed limit. If you are pulled over, the officer expects you to pay the fine on the spot. - Stop at every opportunity to get gas when driving in rural areas, gas stations are few and far between. - Be cautious of wild animals crossing the street around mountainous areas, especially larger animals like deer, elk, and moose. While most visitors are safer while exploring in Norway than they are when back in their home country, it is always important to take preventative care and measures to ensure your health and safety while abroad. Norway is ranked 9th in a survey studying the world’s safest countries, so concerns are relatively few as you consider your plans. The basic needs for health and safety are completely covered. Tap water is potable in the major cities and in the small towns and villages across the country as much of the water derives from the natural snowmelt and rushing rivers. The waterways around Norway are just as clean and contain more natural minerals than the bottled water that many in the Western World drink at home. If on a hike or out in the wild, be sure not to drink from streams as they harbor giardia or other known parasites. The safest way to drink water when in nature is by boiling the water to purify thoroughly before drinking. In high altitudes, the water boils at a lower temperature, therefore, you should always boil the water for up to 10 minutes to remain cautious. When carrying medication across the border into Norway, remember to bring your prescriptions with you in case the border agent asks for documentation. While regularly not an issue, certain medications may be considered illegal or questionable under Norwegian law but may be perfectly accessible back home. Larger cities like Oslo and Bergen do bring a minor risk of pickpocketing or scams in popular tourist areas. Taxis are a reliable source of transport, and Norway is a safe destination for solo travelers, whether exploring alone or with a group of friends. Toll roads automatically charge your vehicle. If you have rented a car, expect to receive an invoice at your home address weeks or even months after your journey through Norway. One of the main safety tips for any city is to avoid parks at night unless attending a festival or an area with largely populated and well lit due to the wooded nature of the landscape. Remain comfortable by always preparing for rain on days you expect to spend time outdoors. The biggest and most unexpected risk in Norway does not stem from any human-made obstacles like pickpockets or scams in the big cities, but more from the realities of a country full of wildlife and weather. Deer make their home across the country, but especially in the tundra areas. Deer rarely travel alone, so if you see one deer cross the street, chances are a second or third deer will shortly follow. Deer account for a significant number of car accidents and ample damage to cars, as well as moose and elk, are known for jumping into the streets outside of major metropolitan areas. Sheep and goats also walk on the roads in farming areas, so care is needed as you drive. Mosquitos and blackfly bites pester hikers around central and southern Norway with the pesky insects emerging from the tundra bogs and lakes in the summer. Long pants and long-sleeve shirts can protect the greatest exposed areas on your body and try to cover your neck and head. Norway supports approximately 50 brown bears and 50 wolves, making contact with these wild animals unlikely. However, if hiking in an area where brown bears have recently been spotted, it is important to make noise when rounding blind corners to announce your arrival to any bears in the area. It is when surprised or protecting their young that a bear will most likely attack, but this is highly unlikely as you travel in Norway. If traveling to Arctic landscape of Svalbard, a region located halfway between the Norwegian mainland and the North Pole, you should remain aware of the 2,000 polar bears living on the island. While cute and unassuming from afar, the polar bear is less predictable than the European brown bear and can outrun any human, especially when on ice or snow. Making contact with polar bears is forbidden due to its jeopardizing the safety of the animal and the person. If traveling outside of the main town of Longyearbyen, you should remain in the company of a guide or escorts. If camping, remember to carry flares and keep all food and waste at least 300 feet away from your tent. The archipelago is also 60 percent glacier, making it necessary for any traveler exploring the landscape to report their itinerary to the local governor for your safety in case of extreme weather, shifting ice, or other unforeseen hazards that can occur during your travels. There are no necessary vaccines when traveling to Norway, but the World Health Organization recommends visitors to receive diphtheria, tetanus, mumps, rubella, and polio vaccinations regardless of their travel plans. A rabies vaccination is not specifically recommended unless you plan on working with animals in the countryside, as a bite or scratch from an infected animal, especially those in Svalbard or in eastern Finnmark, could carry the disease. Dogs are the most common carrier but cats, foxes, and bats can also carry the infection. If scratched or bitten, scrub the area with soap and running water before applying a type of alcohol or solution. If you have been infected or worried about infection, seek medical treatment immediately. Lastly, the weather can change rapidly throughout the day and at any time of the year, shifting from sunny to a huge storm without warning. If on a day hike or taking a longer trail, inform the tourist board or the local rangers of your itinerary in case inclement weather occurs. Hypothermia is a common issue among travelers unfamiliar with hiking in the old weather or the rapid changes throughout the day, especially in the heat of summer. The Norwegian toll-free emergency service number is 112.
Leisure offers a variety of personalized Norway tours tailored to your preferences, requirements, desired destinations, and activities for a perfect and meaningful Norwegian vacation. Travelers can experience the convenience of self-planned and independent travel or the joys of sharing the journey with others on a packaged group tour curated by a travel specialist ensuring a hassle-free experience. Indulge in magnificent accommodations, the knowledge of authentic local guides, and the thrills of unimaginable excursions. Let us know about your dream Norway vacation, and we will match you with two or three Norway specialists who will help you craft the perfect vacation fitting your interests.